Beyond Pesticides and The Organic Consumers Association (OCA) today responded to a federal judge’s ruling against Monsanto Co.’s motion to dismiss the groups’ lawsuit, filed in April, 2017. The lawsuit challenged Monsanto’s safety claim on its Roundup (glyphosate) products as misleading and fraudulent. Monsanto displays a claim on its Roundup product label that states that the chemicals in the product “targets an enzyme bound in plants but not in people or pets,” when, in fact, the chemical adversely affects beneficial bacteria essential to the gut biome and normal body functions. “In the face of EPA’s poor regulation of pesticides, misleading pesticide product labeling cannot be left unchecked. The court’s decision to allow our case to move forward, in denying Monsanto’s motion to dismiss, is critical to showing that the company is deceiving the public with a safety claim on its Roundup (glyphosate) label. Its advertising and labeling claim that Roundup ‘targets an enzyme found in plants but not in people or pets’ is false, given the devastating harm that glyphosate has on beneficial bacteria in the gut biome. The disruption of the gut biome is associated with a host of 21st century diseases, including asthma, autism, bacterial vaginosis, cardiovascular disease, cancer, Crohn’s disease, depression, inflammatory bowel disease, leaky gut syndrome, multiple sclerosis, obesity, Type 1 and 2 diabetes, and Parkinson’s. “Monsanto aggressively markets Roundup as ‘safe’ for humans and animals, despite newer studies indicating that glyphosate may be carcinogenic and its use may affect human and animal cardiovascular, endocrine, nervous and reproductive systems. 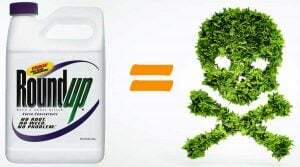 No reasonable consumer seeing the claim on this product that glyphosate targets an enzyme not found ‘in people or pets’ would expect that Roundup actually targets an important bacterial enzyme found in humans and animals, affecting the health of their immune system. U.S. District Judge Timothy Kelly, a Trump appointee, ruled that Beyond Pesticides and OCA presented enough evidence to support that Monsanto’s labeling of its flagship weedkiller, Roundup, misleads consumers. Through their attorneys, Richman Law Group, Beyond Pesticides and OCA sued Monsanto on behalf of the general public, in Washington D.C., under the District of Columbia’s Consumer Protection Procedures Act, for misleading the public by labeling its popular weedkiller Roundup as “target[ing] an enzyme found in plants but not in people or pets.” The nonprofits allege that this statement is false, deceptive and misleading, because the enzyme targeted by glyphosate, the active ingredient in Roundup, is, in fact, found in people and pets. Featured image is from Beyond Pesticides.